Unless you've been living under a bush, you'll know that berry shades have been huge for around two years, and in this launch, Inglot have created five new lipstick shades and six new nail varnishes, along with expanding the range of Kohl Eye Pencils by an additional three colours, brown, navy and berry. These five new Lipstick shades (€12) are all beautiful, dark, vampy, intense, moody colours. I personally dislike the numbering scheme Inglot employ - I prefer to use names rather than numbers, but this is a minor bugbear. I love the look of #294 in particular above... looking forward to a look at these soon. The three new Kohl Pencil shades (€14) are designed to match the nails/lips. 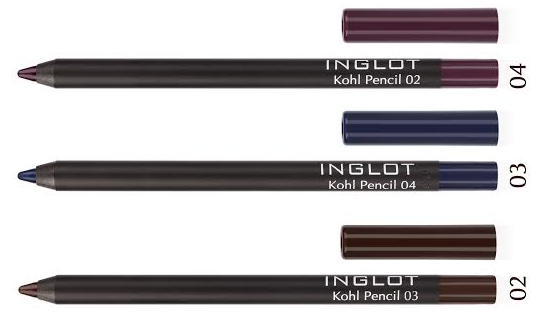 I do love the Inglot black Kohl pencil (it's really really super black) and I'd expect nothing less from these in terms of pigmentation, interested to try these out - all are shades I (more or less have already) but I love the look of #02 in particular. As with all Inglot launches, they're celebrating with a generous 10% discount off all products (not just the Spring collection) all day in store, which is a nice incentive to purchase. Available 16th January in (that's today, peeps!) in Inglot stores all around Ireland.